All order free shipping to worldwide,send in 48 hours. We accept PAYPAL or Credit card payment! This support is suitable for injury, sprain, twist, caused by sports or weight, or arthritis and R.S.I, caused by extensive typing. This heating wrist belt can improve the microcirculation of the wrist and the hand.Promote fracture healing and improve wrist strength. hyperplasia or wrist arthritis,rheumatoid arthritis,joint sprains,contusions,soft tissue damage,congestion,swelling,pain,vasculitis and so on. * Self-heating pad designed for the wrist. * With dual thermoelectric and piezoelectric effect. * Forms a resonant magnetic field resonates with the human body. * Can effectively improve blood circulation, promote metabolism, and clear the meridians, enhance immunity. * Applicable to bone hyperplasia, wrist pain, joint pain and other symptoms of hyperthermia therapy. * Easy to use, discreet and can be used anywhere any time. * Wipe Tourmaline cloth part, and then fasten it to the sore. * Safe & comfortable to wear. * With Velcro closure, easy to take on/off. * Generally 30 minutes later it will work. * 1-2 hours per day is recommended. 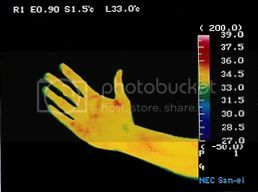 * If the body part appears redness, fever, hyperthermia, it is a normal phenomenon,With time, heat intense will become weak and the heating time will get longer. * Pregnant women, kids and those who suffer hypertension, heart troubles, weak wisdom, disability to self manage the life. * Do not use the product in sensitive parts such as eyes. All order free shipping to worldwide;All USA order will send by USPS with tracking number;Order amount more than USD$20, will send by registered airmail. If you have our coupon code,please make sure you click "Update" button after input the code! We accept PAYPAL or Credit card payment,please click "Purchase" button to choose payment method!